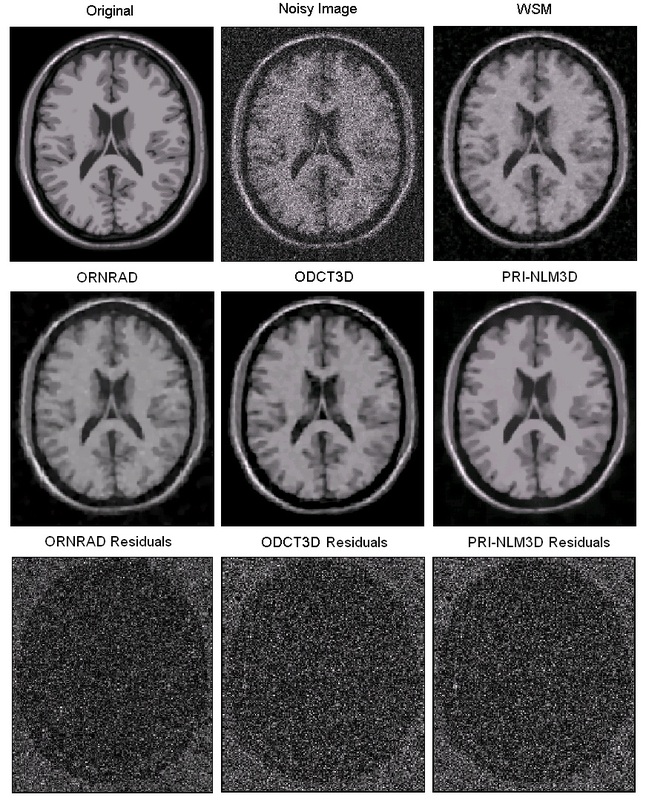 This paper proposes two new methods for the three-dimensional denoising of magnetic resonance images that exploit the sparseness and self-similarity properties of the images. The proposed methods are based on a three-dimensional moving-window discrete cosine transform hard thresholding and a three-dimensional rotationally invariant version of the well-known nonlocal means filter. The proposed approaches were compared with related state-of-the-art methods and produced very competitive results. Both methods run in less than a minute, making them usable in most clinical and research settings. Example results for 15% of Rician noise. Manjón J.V., Coupé P., Buades A., Collins D.L., Robles M. New Methods for MRI Denoising based on Sparseness and Self-Similarity. Medical Image Analysis, 16(1):18-27, 2012.